This morning on the Cetacea we headed out to the northwest corner of Stellwagen, Bank which saw a lot of activity over the weekend. Today was no different. 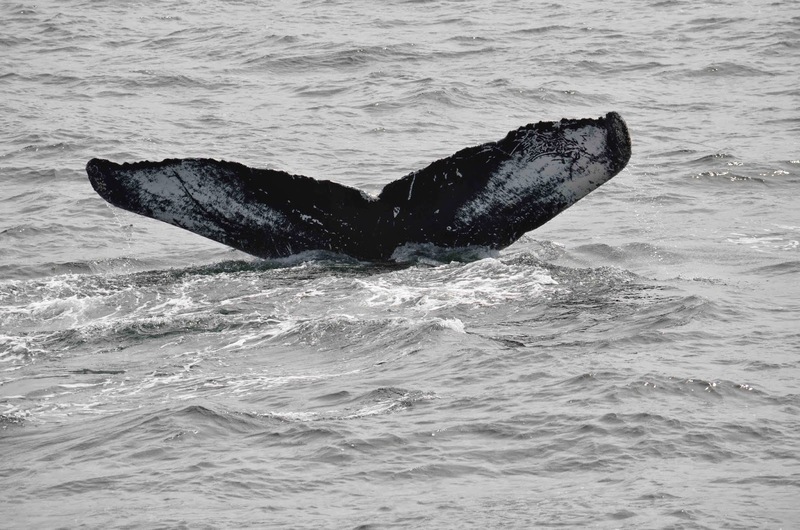 We spotted multiple blows in the area and joined a humpback named Hancock, a female born in 1991. Hancock defies some our whale naming conventions, particularly that we don’t name whales after people or give them names which are distinctly male or female. That is unless there is a distinct pattern reflecting that name. Hancock is named for some loopy white marks on the bottom left of her fluke (not visible in my photo unfortunately!) that sort of look like a signature. So she was named after the most prominent signer of the Declaration of Independence. Hancock was taking long 10 minute dives but when she did come up we could see the evidence of her feeding: bubbles and some straining. Pepper, another female humpback, came into the same area as Hancock and we thought they might join up to feed but it wasn’t the case. Pepper was one of the very first whales to ever receive a name and she got it because she was seen with Salt a lot that particular year so Salt and Pepper, since then Pepper hasn’t been seen very often with Salt so we learnt not to name whales based on the names of other whales. We got a few more looks at Pepper and had to home back to Boston.